I've seen infomercials for these things for the longest time for Ron Popeil's variety. 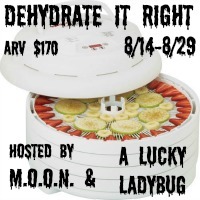 This isn't his dehydrator but here's a chance to host a giveaway for the Nesco version. The giveaway will run from 8/14-8/29 and you get a free Twitter/Pinterest/Facebook link if you host. Signup before 8/11 if you're interested and tell them Java John Z's sent you. Thanks.